College life is full of fun. The best phase of one’s life. Most of us experiment with our looks, be it a haircut or an eye makeup, we tend to give it all a shot. Each and every college girl has her own style and beauty secret which is exclusively tried and tested to suit her personality! Moreover, as college girls, we’re always looking for tips and tricks that are affordable and time-saving. But, when it comes to nails, they stick to the same old nail polishes. Bright red or goth black or better still, the trending colors. However, this summer, why not give your nails a cute makeover? If you are tired of wearing the same old nail polish and have been looking to try out something new then nail art is the thing for you. 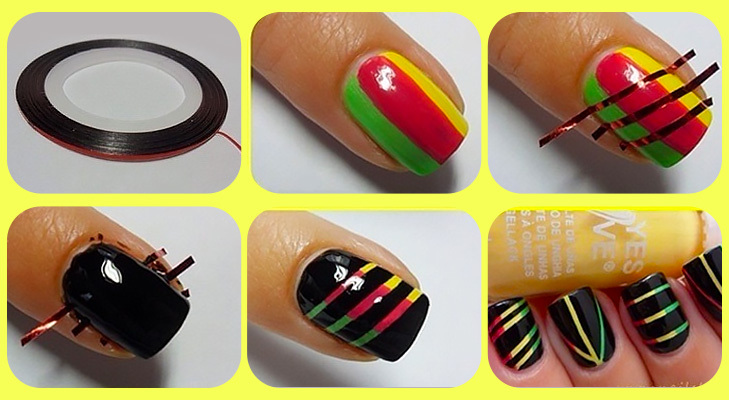 From sporting chic stripes to animal prints to ultra-cool polkas, nail art is really taking world by storm. If you aren’t interested in visiting a nail art salon for an elaborate nail art design, or due to lack of time you can’t sit and draw butterflies with the nail art tools, but still want to look cool, then here are 6 nail art hacks to try. Now decorate your fingernails in ombre, polka and stripes, within minutes for an ultimate college look. 1. Sponge for ombre nail art design: Paint your nails with a light base color. Take a flat dish on which you can swirl or make horizontal lines (side-by-side) with two nail colors (of your choice) together with a toothpick. In order to have the pattern across a small makeup sponge, dab the sponge onto the polish a few times, and blot onto your tips. 2. Use scotch tape to achieve a perfect French manicure or geometrical nail art designs: We did mention a bit about this in our previous post! And we repeat, scotch tape is quite a helpful tool, specially when you are trying to achieve the perfect French tips. 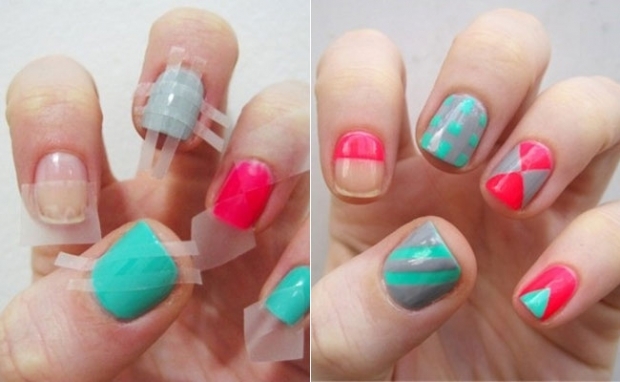 Just stick straight-horizontal pieces of the tape on the nails, and leave the tips exposed. Now, apply a coat of white polish on the exposed tips. Let it dry for 10 minutes. Peel off the tape from the remaining part of your nail and apply a layer of base coat. That’s it. Simple, isn’t it? 3. Use scotch tape to prevent the edges around the nails from getting painted: One of the best makeup fallout hacks ever! In order to protect the skin edge around the nails from getting painted, apply some scotch tape on it and then apply nail polish to your nails. Once applied, wait for the paint to dry off so that you can peel it off from the skin without causing any damage to the freshly applied nail polish coat! 4. 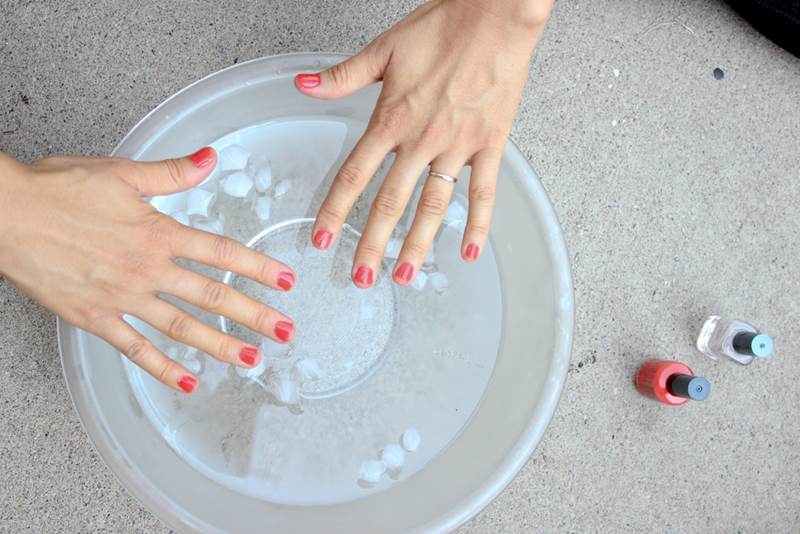 Use ice water to speed-up drying: If you are in a hurry and the last thing you want is to spend 20 minutes for drying-off that awesome nail art, then here is a trick. Soak your tips in ice water after you paint them to speed up drying time. It will only take 5 minutes. We promise! 5. 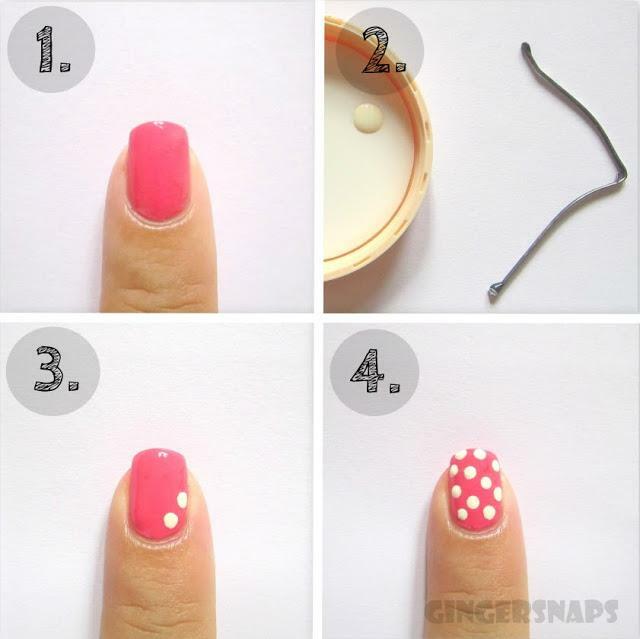 Use toothpick/ bobby pin for polka nail art design: Polkas in fashion. So, this season, apply a light base color on your fingernails and let the paint cool-off. Now, dip the round, pointed side of the toothpick or a bobby pin in your choice of nail color and start dabbing it on the nails. It could be small dots or bigger ones (depends on the size of the toothpick/ bobby pin’s circular-end). 6. Use paint brush to create artistic glitter effect: The best way to add shiny glitter on your fingernails is by dipping a small paint brush in the pot of shimmer powder. 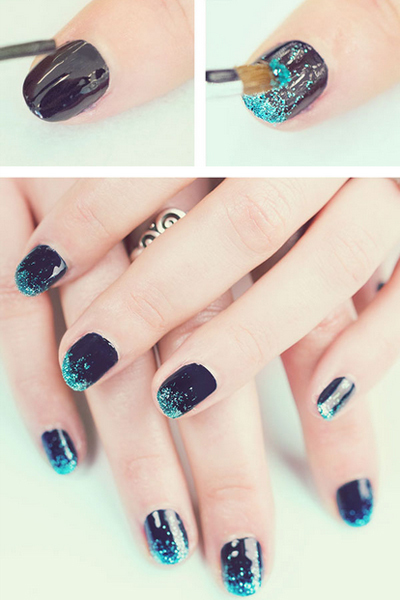 First, paint your nails in a clear nail polish or a darker hue. Now, sprinkle on some glitter (in contrasting shade) with the paint brush. To ensure it sticks to the base coat, apply a layer of nail glue.